I see it and hear it everywhere, all of the time. Most aren’t even aware that they are falling short and failing in these areas. These are the “Tools.” These are men and women of all ages, incomes, colors, and creeds. In their world, Tool Time is all the time. The problem is that these aren’t the types of tools that fix things. You can’t fix what you don’t know is broke. Tool (noun) – 1) A blow-hard who claims they’re a great communicator, but often demonstrates the exact opposite in their actions. 2) A numb-nut who devalues the necessity of sharpening their communication skills ongoing because they claim to “already know all of this stuff.” 3) Someone suffering from chronic communication self-delusion disease. 1. RESPOND when someone compliments or congratulates you. If someone takes the time to extend a nice gesture your way, the least you can do is say “thank you”. Ignoring this speaks negative volumes about your Toolness. It says you don’t care (even if you do). Failure to acknowledge a shout-out turns into an insult that gets boomeranged back to the sender. How friggin’ hard is it to take 10 seconds to show that you are not a complete, obliviously insensitive Tool? 2. Be RESPONSIVE to timelines you give or receive. If you say, “I’ll get back to you tomorrow,” then Get Back To Them Tomorrow! Follow-through for f@ck’s sake… Failure to do so is telling others they are not that important to you, and/or you don’t care if others view you as a large Tool. If you truly do not care about either of the above, then you truly are one of the larger Tools in the box, and should click-off now. 3. Relinquish need to be RIGHT all of the time. 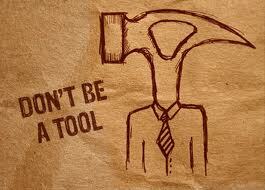 Tools think they’re always right. They’re not, you’re not, and neither am I. Be open to the possibility that you either a) don’t have all of the information necessary, or b) you may have some inaccurate information at times. Humility and Toolness are inversely proportional. When the ego is in check, the Tool-In-You has likely checked out.